Hi Peter (and others interested in this thread). >> this one is a prepared one: Ὀ (i.e. one letter Omicron with psili). > psili. Could this be handled by xunicode.sty? then looking at what comes next, to be able to decide what to do. should no longer be needed with Unicode input. macros to give Unicode output that  XeLaTeX can now work with. In the situation here there are no macros to be redefined. Instead we have sequences of Unicode characters; well, a pair of them. *font-mapping* as part of the command used to declare the font. the reason why there is a problem. 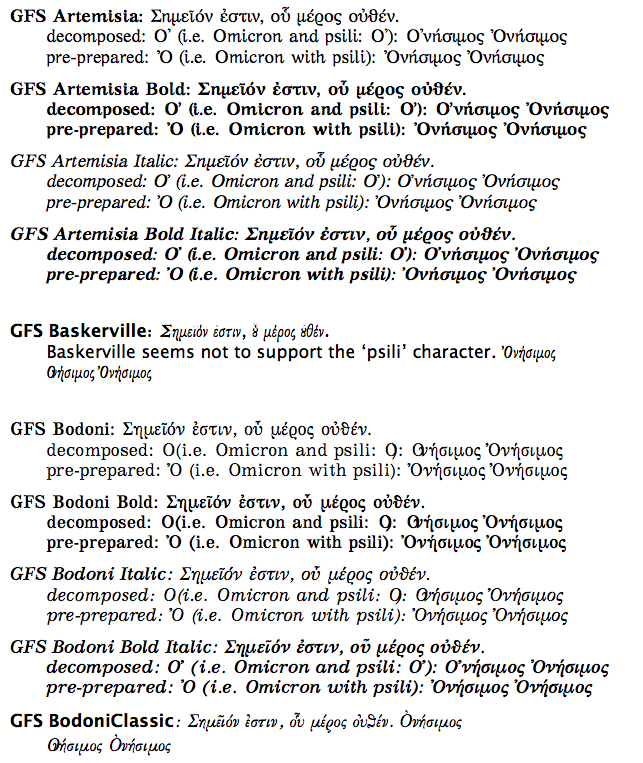 You may wish to consider using other fonts for the Greek text. by the GFS fonts, which were announced on this list some weeks ago. using XeTeX 0.996 on a Mac, with  xdvipdfmx version 0.4.
software or in parts of XeTeX. character as a bare character, but do support pre-composed glyphs. GFS Baskerville and GFS Bodoni variants. 'Omega with psili'  (i.e. U+1F48; ). The difference is usually visible. being a single character and the 2nd using the combining character. "Omega + combining comma" combination is created. it works fine (modulo the font problems discussed above). However, I also obtained the 2 pieces for it using the "Characters"
palette under MacOS X 10.4 (i.e., Tiger, not Leopard). TeXshop's editor window, so there is no combined character glyph. cannot be detected using TeXshop. Remove it in the other editor. Now typeset and the combined character indeed results. space returns, so that typesetting gives separate characters again. Touching up every time in Alpha is a real nuisance. and later versions of  xdvipdfmx  and  xdv2pdf . > When in doubt, use brute force.